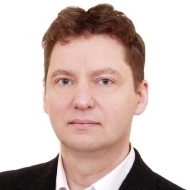 Sowa is a Subjective Overall Workload Assessment method and supporting software. The subjective workload evaluation includes four fundamental dimensions: (1) Manual material handling, (2) Material work environment, (3) Body posture and movement, (4) Mental demand. Each of these dimensions is characterized by several attributes. The detailed structure is presented in table below . The person being examined is asked to rate each of the specified workload dimensions parameters on the 20 step bipolar scale . 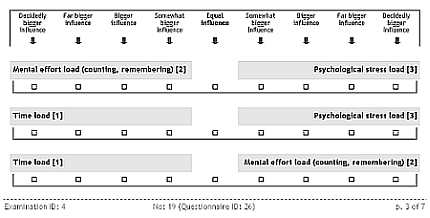 In order to determine weights for individual workload attributes, the Analytic Hierarchy Process (AHP) technique developed by Saaty (1977, 1980) was used. Subjects first make pairwise comparisons of parameters within the confines of each dimension and then the same procedure is used for calculating weights for the workload areas. Products of these weights and obtained earlier parameters scores are summed up in every dimension. These values are then multiplied by dimensions weights. 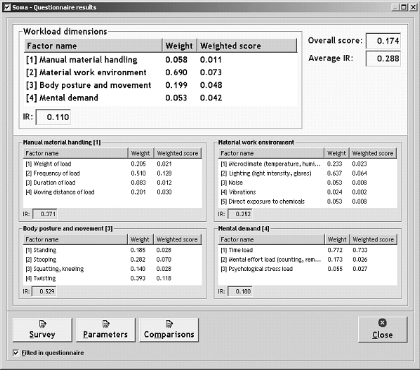 The sum of the four weighted numbers gives the overall perceived workload assessment index (OPWAI). Taking advantage of the AHP technique for determining the importance hierarchy of workload components, allows for calculating the consistency ratio (CR) for every dimension. It is assumed that a CR value less than 0.1 indicates a high comparisons consistency, whereas CR values equalled approximately 0.5 signify considerable incoherence.